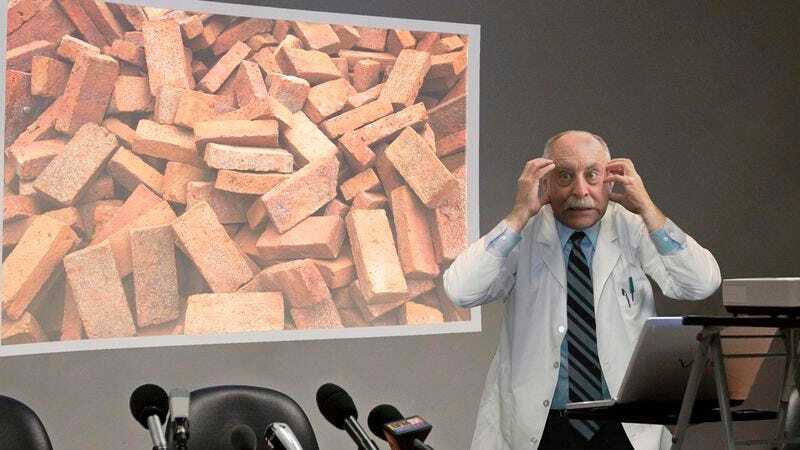 Completely unhinged researchers say the bricks will stop at nothing and are incapable of being reasoned with. Written in a reported four days, the 20,000-page document states that all we have to do is open our goddamn eyes because the bricks have been right in front of our faces the whole time, and later goes on to say that the bricks are not our friends, that they never were our friends, and that if they act like they want to be our friends they are lying. More and more bricks are coming, the report states. According to the study, the bricks are very intelligent, are constantly evolving, and have figured out a way to become visible even when you close your eyes, even when you think there could be no bricks. Unbalanced researchers confirmed that when the bricks appear, which is always, they stack themselves and then rearrange into different structures like arches, almost as if they are showing off. The bricks are reportedly most powerful at night, cannot be destroyed, and, researchers said, only talk whenever they form a face—typically that of a parent or former schoolteacher—and even then only use their mortar-formed mouths to let out a high-pitched shriek or emit a low, monotone laugh. While authorities nationwide have confirmed no sightings of 5,000-foot brick walls suddenly appearing out of nowhere or armies of bricks camping outside one’s front door waiting for the homeowner to emerge, researchers said there are a few tactics one can employ so as not to frustrate or anger the bricks. One, the unhinged study said, is to be quiet around the bricks. Second, screaming makes them nervous. And third, if one is going to feed the bricks, fruit is best. Bricks that can fly, the report stated, have no weakness because they fly very fast. While the study concluded that there is no doubt the bricks will take over the world, what the bricks want to do with their power remains the question.